The struggle for Catalan independence has re-awakened the masses in the past few months, but it has also tested many forces on the left in the Spanish state. 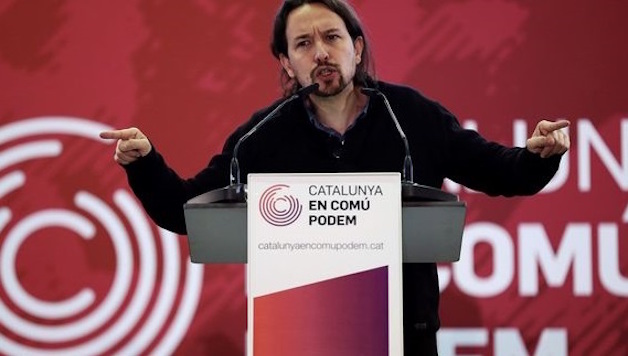 PODEMOS, one of the leading forces on the Spanish left, has been found wanting as the party leadership not only refused to support the mass struggle for the right of self-determination, but carried out a purge of independence supporters within the party. During the build-up to the recent elections in Catalonia, PODEMOS leader Pablo Iglesias scandalously attacked the independence movement for provoking the rise of the far-right and fascist forces. On December 20, the day before the Catalan elections, the U.S.-based leftist magazine Jacobin published an interview with Iglesias, where he reiterated many of his attacks for an American audience, calling the independence struggle a “dead end” and accusing it of “fostering the unification of its adversary.” As such, we are publishing this article by TOHIL DELGADO from Izquierda Revolucionaria. Socialist Alternative is in political solidarity with Izquierda Revolutionaria through the Committee for a Workers’ International. The article was written for a Spanish audience on December 4, in response to Iglesias’s initial comments, but it takes up many of the issues raised in the Jacobin interview. Fascism is not awakened by the people fighting for their rights, it is emboldened by those who do not fight it. From the initial surprise you can only leap to outrage when it seems clear that this will be one of the slogans that En Comú Podem (left coalition in Catalonia including Podemos, United left and others) will use in the elections of the 21st. It is an aberration and a real scandal to consider that the impunity with which a government and a State that is the heir to Franco’s regime uses the law to crush our democratic rights, is the responsibility of two million people – mostly young people, workers, retired and unemployed – who decided to challenge the regime of ’78 (year in which the Spanish state adopted a constitution as a “parliamentary monarchy” in a compromise between the reformist left leaders and the politicians of the Franco dictatorship) and exercise their right to decide. It is unprecedented to try to blame the people mobilized to purse their democratic aspirations, for the Spanish nationalist campaign that is vomited every day with an unprecedented force in the media, or for the resurgence of fascist aggressions. Who makes it possible for the fascists to run free in the demonstrations of the Ciudadanos and the Partido Popular, for right-wing militants in Valencia well-known to beat young people facing no opposition from the police, or for fascist gangs to be able to legally rally in front of the CUP’s (left pro-independent Catalan party) headquarters in Barcelona without any consequences? Is it the fault of the people of Catalonia, who have been mobilized by millions, in a peaceful and exemplary manner, against a State and a government that denies their right of self-determination? The statements of Pablo Iglesias and Juan Carlos Monedero embarrass the entire left. As Albano Dante Fachin, the head of PODEM en Catalunya, forced to resign by the leadership of the party, pointed out, it is like holding Salvador Allende responsible for Pinochet’s coup d’état. We add: it is like blaming Spanish workers and peasants for having instigated Franco’s fascist coup when they fought with all their might to transform society. How far are Pablo Iglesias and the leaders of PODEMOS willing to go in their political renunciations? Is this how we are going to end the rotten regime of ’78, considering that when people mobilize for their rights they are provoking the reaction? Are they aware of the atrocity that this means, and how they play into the hands of the right with this type of argument? If something strongly stands out from these statements it’s the severity with which they accuse the people mobilized, and the cowardice and negligence with which the PODEMOS leadership treats fascists when they attack the institutions in which they govern. We refer to the case of the Nazis within the Municipal Police of Madrid, and the use of a collective WhatsApp group in which death threats were levelled against the mayor Manuela Carmena, along with xenophobic and racist cruel insults, compliments to Hitler and fascist propaganda of every kind. The case has leapt to the media and is well-known. The response that Ahora Madrid (left coalition in Madrid city-council including Podemos, United left and others) has given so far to this real and tangible threat has been very poor: only temporary suspension to three of the 150 agents participating in this fascist chat. The CCOO (one of the main state-wide unions) has denounced how this extreme right group entrenched in the local police is made up of some twenty-five individuals. Not firing them outright and disqualifying them as public officials immediately, is what fuels the impunity of these groups, which, as is evident, are found in the different police and state organs, organized and attacking without hardly facing any significant consequences. Is this how PODEMOS face fascism? In any public or private enterprise, if a worker commits a disciplinary offense against his boss, he is immediately sanctioned and can be fired. In the city of Madrid, when a large group of police officers, including a person responsible for the staff, makes public death threats against the mayor, and makes an open incitement to racist crimes, hardly anything happens. Instead of imposing an exemplary punishment and calling for citizen mobilization against these criminals, the leaders of Ahora Madrid follow “the official channels”, offering a legal twist by which these elements can easily escape. The complicity of the government, the media, judges, prosecutors, police and military is what “awakens the force of fascism” and regretably, a timid, cowardly and “legalistic” attitude, against threats of this kind, also increases their impunity. The comrades in the PODEMOS leadership have made a serious mistake by making the aforementioned statements. If they are really worried about the rise of the extreme right, they should call for the most forceful social mobilization to put an end to the Amnesty Law of the crimes and criminals of the Franco regime, demand the purging of these elements from the State apparatus and act accordingly where they have the power to do it. To look the other way, to ask for that same contaminated justice to act, or to hold responsible of the extreme right’s boom to those who fight against any type of oppression, the only thing that does is to confuse the population in general and give a new lifeline to the reaction.